Question: I'm looking for information about how to rent a yurt? Dee's Reply: Hi Manuel - There are two places on Cape Cod where you can rent a yurt: Shawme-Crowell State Forest in Sandwich and Nickerson State Park in Brewster. Shawme-Crowell State Forest is a small (about 700 acres) camping area located at the very beginning of the Cape in Sandwich. It's a verrrrrry quiet campground with not a whole lot of fancy amenities. There are walking and biking trails, a camp store, a covered pavilion, a small playground area for the kiddies ... and that's about it. Nickerson State Park in Brewster is a much larger camping area (1900 acres) with a lot more going on. Nickerson has ponds for swimming, boating, and fishing, along with hiking trails, paved bike paths, boat rentals, interpretive programs and organized activities. Yurts come in two sizes. A large yurt will accommodate up to 6 people, and the smaller ones are suitable for up to 4 people. They all have electricity, and water is available outside. Some (maybe all?) have wheelchair ramps. Campers provide their own sheets, towels, food and other necessities. Yurts are a very popular camping - and "glamping" - alternative, so reservations fill up quickly. To have the best shot of getting your preferred dates, plan to reserve early ... as much as six months in advance, if possible! Shawme-Crowell currently has 4 large and 2 small yurts. There's no minimum stay requirement, even during the height of the season. But the maximum stay is a total of 14 days. 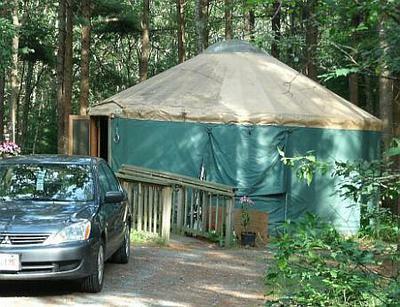 2014 rates are $30-$40 per night, depending on which size yurt you want. Nickerson State Park currently has 2 large and 4 small yurts. From Memorial Day to Labor Day, yurts are rented for a minimum of 1 week at a time. Before Memorial Day and after Labor Day, shorter stays are allowed. There's no yurt camping in the off-season. Rental rates for 2014 are $30/night for a small yurt and $40/night for large. I hope I've answered all your questions, Manuel. If there's anything else I can help with, please feel free to ask!